Rick Perry is at it again, chasing his dreams of becoming the most powerful person and defacto leader of planet earth. This time around he’s armed with cool hipster glasses, a load of famous Navy SEALs and a C-130 Hercules campaign plane. Well, more like a campaign plane prop, as in one that won’t fly. Perry kicked off his campaign flanked by what at first looked like heavy duty security. Was the placement of these two intimidating secret-service looking guys part of an attempt look Presidential? Surely, but these were not renta-cops, the two men in question were actually Marcus Luttrell and Morgan Luttrell. Marcus was the Navy SEAL whose book Lone Survivor topped the charts and spurred a Mark Wahlburg action flick that was based on it (sadly not too closely). His brother Morgan was also a Navy SEAL. Taya Kyle, widow of famed “American Sniper” and Navy SEAL Chris Kyle, was also in attendance, along with Navy SEAL Medal Of Honor Recipient Michael Thornton. 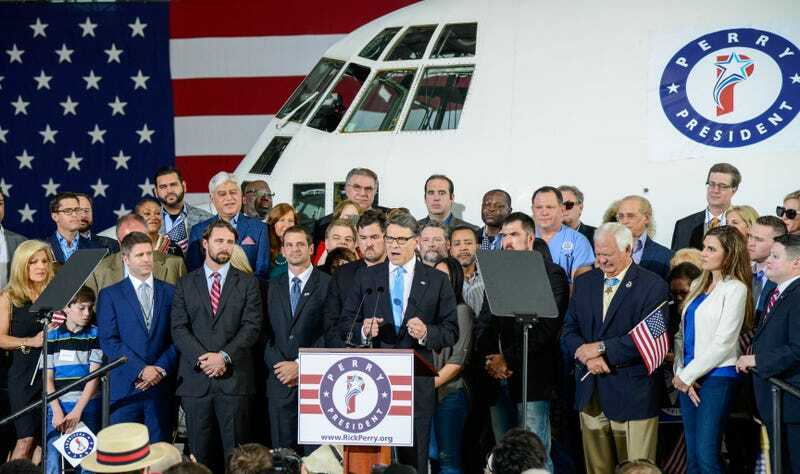 Looming behind the cluster of all of these military affiliated guests was a big white C-130 with Perry’s campaign logo temporarily adhered to its forward fuselage. By looking at the cargo hauler’s paint job, it appears to belong to International Air Response. All added up, the atmosphere seemed more like a visit to a military base on Veteran’s Day than a campaign kickoff. Perry was a member of the armed services himself, having been active from 1972 to 1977, where he flew C-130s for the USAF out of Dyess AFB in Texas. Aviation has also played a role in Perry campaigns in the past. He flew across Texas while campaigning for Agriculture Commissioner in a WWII era B-25 Mitchell in 1990. Between the two star Navy SEALs, the most prolific sniper in U.S. history’s wife, a Medal of Honor recipient and the civilian C-130 stand-in, it’s pretty clear where Perry is going to place his chips in this Republican campaign circus – it’s all about the military and service. This may be Perry’s best card to play considering last Presidential Election cycle’s on-stage intellectual and off-stage campaign implosion, and because aside from Senator Lindsey Graham, Perry is the only Republican running with any military experience at all, at least as far as I can tell. So there you have it, the super-versatile C-130 Hercules has now been used for yet another crazy mission and high-risk mission: as a campaign symbol and political backdrop for the ex-Governor of Texas’s second Presidential Run.